The RoscoeView Journal has an interesting interview with the new principal at Lake View High School. (Thanks to another wonderful and well-read blog reader for sending me the link!) It is fairly long-ish, but worth a read. I’m pulling in some of the key points. Overall, I think Dr. Werner, gives “good talk” for a principal. I admit that I’m a sucker for that. I don’t believe I’ve ever seen “proof” or research that a good-talking principal (or even a good principal for that matter) is directly correlated with Results. Perhaps my corporate and marketing background influences me. But I like a principal who sounds intelligent, well spoken, and strategic. It’s what won me over years ago at Alcott (wrote a check for Tuition Based PreK that day – but ended up getting a TBPK going at our local school) and excited me at Bell (never got in) and at Coonley when the Options program was starting. I’m excited that getting LVHS to be a neighborhood high school with a really good reputation is a real possibility. And depressed that she (accurately) thinks it will take 5-6 years. And excited that she wants (NEEDS!) parent involvement. And depressed that it takes a hell of a lot to mobilize it. And excited that she has faith in the staff. And depressed that I don’t actually live in the neighborhood. Oh, the ups and downs of CPS. Werner, who signed a four-year contract, understands there are no quick fixes or short cuts. While her ultimate goal may be to burnish Lake View’s reputation among residents who currently dismiss the school as a choice for their children, she realizes progress will come incrementally. Part of the problem, which Werner experienced first hand in her previous position as principal of Marconi Elementary on the city’s West Side, is that few students enter high school with the skills needed to succeed. “Illinois has done a disservice with the ISAT test,” she said of the measurement used to gauge student achievement at the elementary level. “The ISAT has very base levels of passing. You could get a 35 percent on ISAT and ‘meet standards.’” According to Werner, it takes an “exceeds standards” score to indicate a student is remotely ready to handle the rigors of high school, any high school. Though a movement is underway to link core curriculum in grades K-12 and align elementary testing with the ACT and PSAE standards, for the time being, students are entering Lake View and its peers ill prepared, often through no fault of their own, with a huge disconnect between their presumed abilities (ie, meets standards) and their actual performance. Raise Your Hand meets with Jean-Claude Brizard	What would you ask a Selective Enrollment High School principal? Sounds wonderful. And symposia, block schedules, project-based curriculum and interdisciplinary instruction is already in place at s.e. h.s. It does sound great, but let’s be real. What parent would pass up a SEHS oppty to take a chance on Lakeview? I agree that it sounds great. And, just because it will take 5-8 years to transform the high school, it doesn’t mean that some current students won’t get a great education in the meatime. It just means that many students won’t, and the reputation of the school won’t turnaround until that time. But, having a great principal and excellent teachers is half the battle. Bringing in dedicated parents is the other half. I agree, Marketing Mom – that’s a bit aspirational. I think a more realistic goal is to get those kids who don’t test into a SEHS but have decent scores/grades. Which is sounds like there are plenty of in the Lake View neighborhood. So I guess that would be kids who end up at private schools, charters schools, or in the suburbs. I guess I can see if LVHS is in full bloom and a child like mine (good test taker, general slacker) got into Whitney Young or another academic-intensive high school, I might prefer a well rounded neighborhood high school to the SESH option. Boy, we are talking dreamland here, huh? I agree with the new principal – parents have to rally around this, like starting NOW. On a separate note, I will need to figure out where to move in the next year or so. All signs point to the Amundson zone, but boy, I would really like to be in the Lake View district. Lincoln Park is probably too far south for me. Ergh, the decisions. Parental involvement can go a long way toward improving a school, but, to be fair, a couple of other facts likely played a role in the transformation of Blaine. Now let’s turn back the clock a decade. Wow, that is pretty dramatic for Blaine. I certainly agree that if you made that swap in many CPS schools, the test scores would look a lot better. I *think* the LVHS principal gets that and is possibly laying the groundwork for people to realize that she isn’t going to jack the test scores up within the next 4 years (I assume her contract time?) Not saying she’s being defensive, just realistic. The smart money here wouldn’t try to convert the kid who got into an SEHS or Lincoln Park etc… but would target the kid who is just below the cut-off and/or the kid who can do the work at an SEHS but for whom the SEHS’s would be a terrible experience for any number of reasons -basically, a smaller, more intimate school of the same calibre as Lane Tech was say 5-8 years ago. So yeah – it would be considered a “safety school” for lots but it was also be a first choice for plenty for whom SEHS’s aren’t an option for any number of reasons. I personally think there is a tremendous unmet need for a high school that is interested in educating the potentially college-bound student who hasn’t hit their academic stride. Lake View should try to position itself as the kind of school who develops nascent scholars or helps kids to realize their unmet potential – as opposed to skimming the child who has already achieved off the top and honing their competitive natures. As someone who is going to have to go through the whole SEHS process this fall, I would love to have a more balanced, human, normal option for my kid than what the SEHS’s seem to offer. It’s not all about competing and the SEHS’s celebrate and reward a very limited kind of intelligence in my opinion. My kid has a fair shot at actually getting into an SEHS but I sort of dread to think of him going there, he’s a competitive but creative kid and I’ve noticed that the more competitive he gets about school and grades, the less creative he is willing to be. We eschewed the Elementary magnets for a number of reasons and went with the neighborhood school and had a great experience. I am halfway tempted to go this route again (or some variation of it) for high school – except I really think that the teachers are better at the SEHS’s than they currently are at the neighborhood high school. I totally agree that if Lakeview could just be a choice on the list (even if #6) of parents that normally apply only to the SE high schools and/or Lincoln Park IB, Lakeview could be in great shape. If they are willing to send their child there, and they believe it would be a great option for their college bound student, eventually parents may select it over sending their child on a 45 minute bus or train ride each day (to get to WY or other further SE schools). Then, once that happens, scores will go up and reputation will continue to go up. The key is proving that the school is safe and VERY focused on educating children that are planning to and are going to college (with teachers and classes to make that happen). The focus cannot mainly be on bringing kids up to grade level and getting x % to graduate or I don’t think parents will be brave enough to give it a try. I think there is a niche for a school that focuses on helping kids realize their academic and vocational potentials. The key selling point in my mind is that it has a strong counseling component and that every kid graduates with some sort of post-graduation plan whether that be an apprenticeship, college, junior college or a job with a career path. Ideally the curriculum(s) offered would be flexible enough to allow kids to do the exploration necessary to figure out such a plan prior to graduation. I am just trying to be honest about what would drive parents from the Lakeview HS neighborhood to be willing to give the school a shot. I don’t think they would be willing to take the risk if the school wasn’t at least 50% filled with college bound students, maybe even more for some parents. Maybe they could have less than that if they offer a special double honors type program (but still just neighborhood option – not SE test-in) where those college bound kids take separate special classes. i live in the Lake View attenance area, and if my neighbors and I are typical of the whole area, it would be a tough sell getting kids to pass up any reasonable SEHS (and a commute to 111th Street is not reasonable.) The opportunity is getting kids who can’t get in given Tier 4 cutoffs. One of my neighbors decided that given her eldest’s scores, their best bet is to move to the suburbs, which they are doing before the school year starts. Lake View’s first step has to be figuring out a way to compete with the options these kids have, which right now seem to be St. Pat’s, Von Steuben science academy, Nobel Street Charter, and moving to the suburbs. Only then, and possible not even then, will anyone pass up Lane Tech for Lake View. But given that Tier 4 “miss the cutoff” scores would be “Guaranteed Whitney Young!” in Tier 1, that’s a big market to go after. Lake View already has the “Please, God, not Clemente” student market sewn up, so it has some potential to appeal to aspirational students. @ RL Julia: we are on the same page. LVHS should look toward Von Steuben Scholars program as a model. Not as high scoring as the SEHSs, but a cut above the typical neighborhood HS. Pinpoint those kids who just missed SEHS cut-off but have potential to go on to college and succeed. These are the kids who are underserved in the LVHS attendance area (tier 3-4). The NYT has a little piece on a study about the value of a selective high school option in New York. I think it would be interesting to see where kids go from the selective high schools in Chicago and where other students from Chicago at the most selective colleges come from. If Lakeview become a great place to get an education –safe, innovative and getting kids into terrific college– why wouldn’t it be a contender if college acceptance was your end game. Is Von Steuben’s Scholars program similar to Lincoln Park’s double honors? Not sure I know the difference in terms of getting in and in terms of the types of classes they take and if they are separate from the rest of the school or not. Just curious. And, Magnet Mom, “If Lakeview become a great place to get an education –safe, innovative and getting kids into terrific college– why wouldn’t it be a contender if college acceptance was your end game.” I agree – safe, innovative and getting kids into a terrific college sounds perfect to me and no long bus or train ride! @13 thanks for the link to the nytimes story. I really found the comments from grads of the NY s.e. h.s. more useful than the story. @13 interesting article. There does seem to be a shift these days of high performing students looking to position themselves at a school that will be a good overall fit vs. ACT test scores as criteria. There is a valid concern that being at the low end of the spectrum at Northside Prep may do more harm than good when it comes to college admissions. This strategy could greatly help a school like LV sooner rather than later. The comment that hits home here is that these selective schools were once the only safe havens, that is no longer the case. If I were on staff at Lake View, I’d start by addressing the safety and gang concern. If the school is safe, then it should be easy to change the perception by doing things like offering daytime tours for prospective parents, the way the elementary schools do. If it is not safe, then addressing that would make life better for current teachers and students (a good thing, yes?) while showing people in the attendance area that the administration is serious about change. @13 – Very interesting NYT article. What I take from that is not only reinforcement of the adage that top-performing kids will do well no matter where they go, but also that students with lower scores/achievement who have the opportunity to go to a SE HS actually gain much more from the experience than a higher-achieving student. This seems like a good basis for explaining that the lower-scoring students admitted to Chicago’s SEHS due to the Tier system are there for a very good reason. Ms. Werner has the right idea of recruiting families directly from feeder schools, and the target kids are those that don’t get into the SEHS. With the tier system, this will be a goodly number of graduates. I agree with those for whom safety is the biggest issue. I’d love for my kids to go to LPHS. But I’m not sure I’d send them there if they weren’t in IB or DH right now. I just want my kids to be safe and happy. And so safety is the biggest factor for me. I love neighborhood schools — and my kids attend one now. We tend to be jaded on this blog, because it is filled with very motivated and very pro-magnet, SE parents. There are a lot of parents out there who just want a safe school and aren’t into the competitive SE/magnet thing. Late to this discussion but just stumbled upon this particular post… I worked with CPS through a grant program for several years and one of the schools we were in was Marconi. 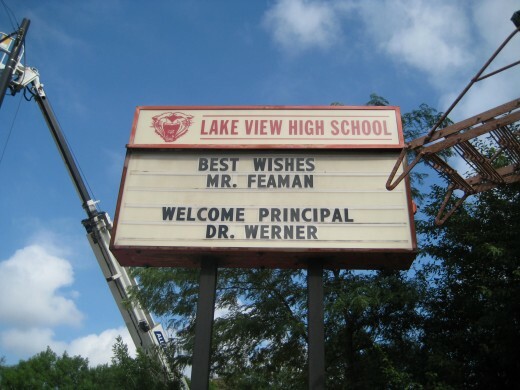 That school was a gem, and I have very high hopes for Lakeview HS under Dr. Werner’s leadership. My impression of Marconi – I was scared to death driving there – the neighborhood was very intimidating. But, once I entered the school it felt like home. It was so inviting – students were actively learning, teachers were collaborating, administration was supportive, parents were welcome and present. As a resident of Lakeview with a young child, I’m so excited to see what happens at the HS over the next few years!